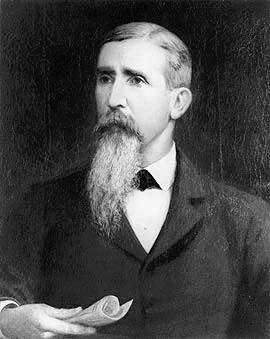 Post Civil War portrait painted by Richard N. Brooke. Original in Fairfax County Courthouse Collection. Photograph courtesy of the Virginia Room, Fairfax County Regional Library. Chichester was a Mason and a Vestryman in the Zion Episcopal Church in Fairfax. By the time of his death, he was the Senior Warden of Zion (now, Truro Episcopal). A plaque to his memory is in the Truro Chapel. His funeral was held at Zion and he was buried in the Moncure-Chichester Cemetery at "Glencairne" in Stafford County, Virginia. His second wife, Agnes Robinson Moncure, was the daughter of Judge R. C. L. Moncure of Stafford County. Judge Moncure was a Chief Justice of the Virginia Supreme Court of Appeals. Chichester was survived by five sons and two daughters. His son, Richard Henry Lee Chichester, followed in his grandfather's footsteps and became a member of the Supreme Court of Appeals of Virginia. In 1873, while Daniel Chichester was Superintendent of Fairfax County Schools, a two-story brick elementary school was built for the village of Providence (now, Fairfax City). It stands today as the oldest brick school in Fairfax County and houses the city's Fairfax Museum & Visitors Center.